We all start out with best of intentions that we are going to lose the weight and get fit and healthy. But then things start getting in the way and the temptations start flooding in. There could be food in the break room, you see McDonald’s on the drive home from work, or you’re out at lunch with friends. You’re resolve starts to slip and the weight starts to pile back on. Here are a few tips on how to get on the weight loss train and stay on. 1. Realise that you are just making excuses. First things first you must recognise within yourself that you are making excuses. If you are really committed to losing weight how is turning to the instant gratification of food going to help you with your goals? Why are you turning to excuses in the first place? These are the things you need to be asking yourself to get to the cause of the problem. 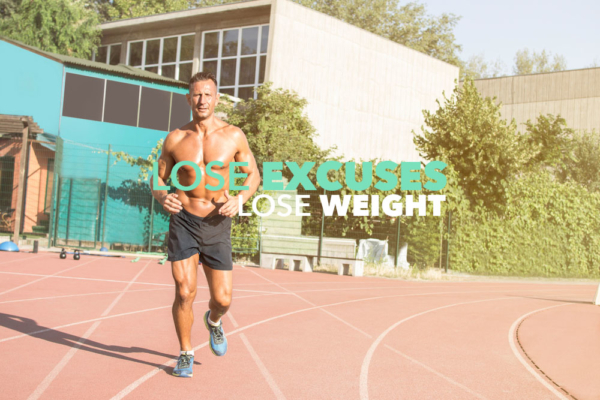 If you are serious about losing weight, you won’t let excuses be your undoing. 2. Remember why you started in the first place. Why do you want to lose weight? Is it for a summer holiday, to fit into a dress for a wedding, or do you just want to be healthier? Whatever reason it is you should write it down, if you haven’t already. Make a note of it and set a recognisable goal for yourself. Think back to the last time you had a bad meal; did you have a healthy alternative on hand? If you didn’t then would it have changed the outcome of you having a slip? Being prepared is the best thing you can do for your diet. If your time poor make your meals in advance and store them, do whatever you need to, to ensure you always have a healthy option. Food addiction whether it be gluten, sugar, fat or sometimes even the texture of food we crave are dangerous. It normally hits at 3pm when you’re sitting at your desk thinking about the donut you just saw your co-worker eat. But giving into these cravings just for the sugar rush is going to dramatically set your progress back. If you give in and eat the sweet stuff you’re just going to want it again, and again, it’s a viscous cycle. 5. Write it all down! Start a journal. You don’t have to do it every day. But when you start to feel the cravings come over you, write down what you’re feeling what excuses are you telling yourself? Take 5 minutes and reflect on why you think you need the fatty foods, the sugar or whatever it may be, write it all down and hopefully by then the cravings have past.